Pokémon Go Somewhere Else | Operation Lifesaver, Inc. The Pokémon Go augmented reality game is sweeping the United States in popularity, grabbing headlines and surpassing other mobile app and game downloads since its launch this month, TechCrunch has reported. While the game is spurring a welcome increase in physical activity, it has also resulted in injuries to distracted players, including a 15-year-old Pennsylvania girl who was hit by a car when she walked onto a highway after playing the game and two men playing the game in California who ignored a warning sign and fell off a cliff. Operation Lifesaver and its safety partners want players, parents and others to be aware that the game may put people at risk, especially if their hunt for Pokémon takes them near train tracks. The National Safety Council issued a statement about safety concerns with the game for pedestrians and drivers. Many railroads have issued their own statements, and the Association of American Railroads shared the above graphic to encourage players not to risk their lives for a game. 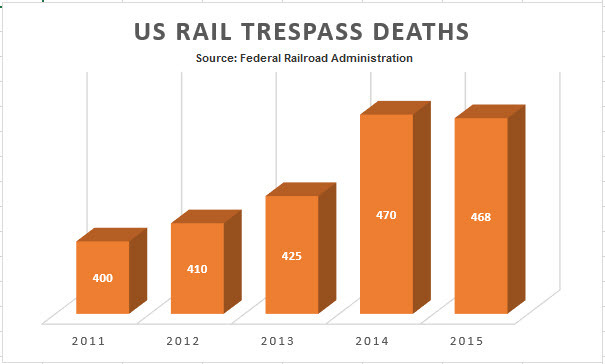 Unfortunately, illegal trespass on railroad tracks and property happens every day; even before the Pokémon Go craze hit, fatalities from this dangerous behavior have been increasing in recent years, according to Federal Railroad Administration (FRA) statistics as detailed in this chart. With preliminary 2016 FRA statistics through April showing an 18% increase in rail trespass deaths compared to the same period last year, Operation Lifesaver, railroads and law enforcement agencies are understandably concerned about the potential for Pokémon Go to further increase these tragic and preventable incidents. As with any outdoor activity, smart Pokémon Go players and other pedestrians who follow these safety tips will live to play another day.